Hopeful of warmer months to come, the slow cooker has been stowed (temporarily) and I've been on the lookout for some lighter, fresher meal inspiration. 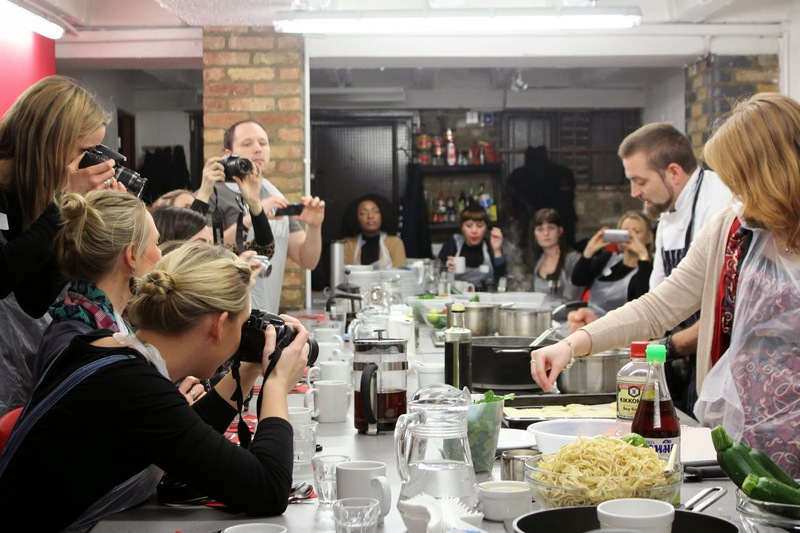 After attending an Asian cookery class last week, I now have some new recipes to try out and add to my weekly repertoire. 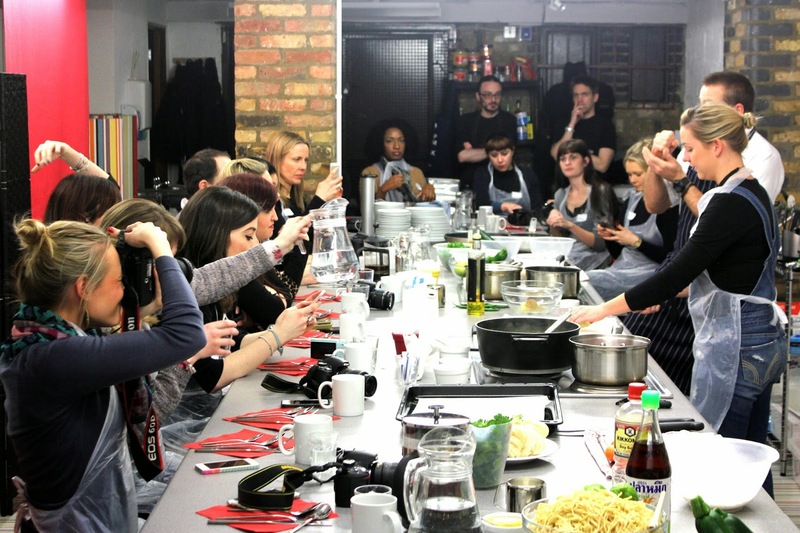 LV= invited some bloggers to attend this class at The Smart School of Cookery as a way of promoting healthy lifestyles. 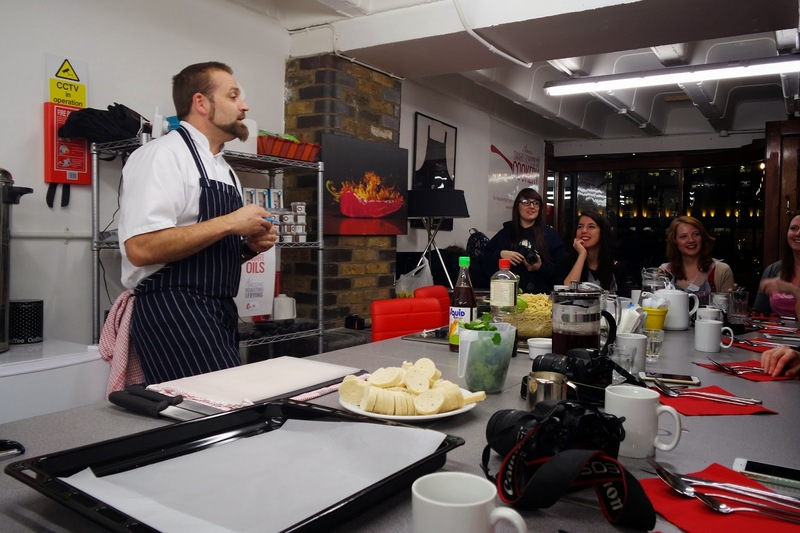 Not only was it great to meet and discover some new bloggers, I also learnt some pretty nifty cooking tips. The kind of tips that are so full of common sense once you know, you pretend you knew them all along! I thought I'd share some of my favourite tips from the evening and some recipes. But of course, we knew it all before, didn't we...? Katrina from Cool Bananas having a chopping lesson. In order to remain tear free whilst chopping onions, breathe through your mouth. Your olfactory nerves are located close to your tear ducts, which essentially means breathing onion vapours through your nose is more likely to make you cry. If you freeze whole fresh chillies, you can grate them straight into a pan. Then heat will defrost them instantly, you use only what you need and it saves a lot of mess and is easier if you're not so good with a knife. The same goes for ginger, including the skin. 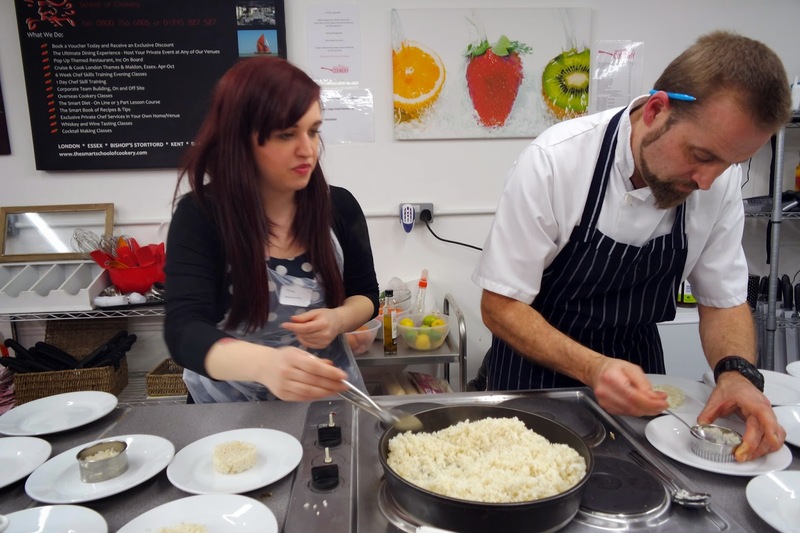 Milly from Mini Adventures plating up our sticky rice with Chef Stu. An easy way to cook rice is baked in the oven in a shallow pan, cover with water and a sheet of parchment. Fluff up and add more water if needed. Short grain rice is best for speed. You'll also get those nice crispy edges that the Spanish call socarrat in their paella. Also, ensure you use rapeseed oil when frying anything. It has a higher burning point, when compared to olive oil. This means you won't be burning the oil and creating carcinogenic fumes. Leave olive oil for dressing and drizzle after cooking. (N.b I've found Sainsbury's own vegetable oil is in fact rapeseed oil and far cheaper. Although the more golden colour, branded bottles are noticeably better with things like potatoes and fish). For a healthier way of adding chicken to dishes, poach the chicken pieces in a pan of water first before adding. Much healthier than frying in oil and also ensures your meat is super tender. 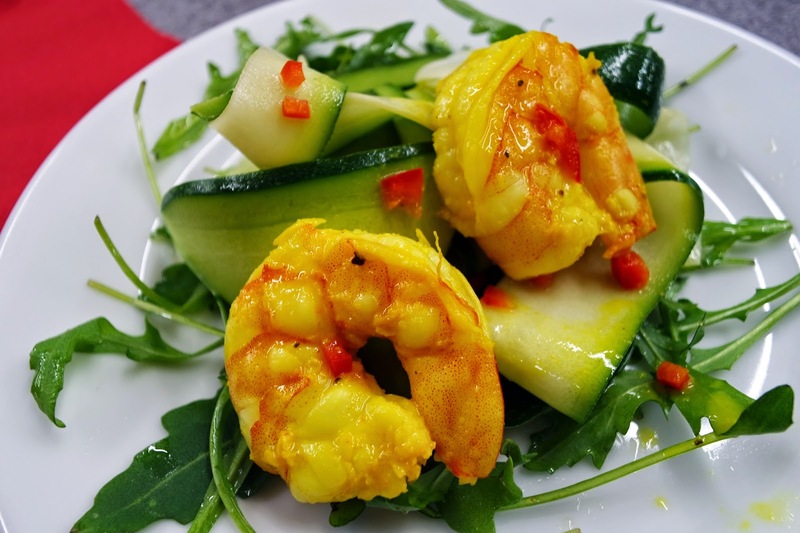 Lime & chilli courgette ribbons served with Asian prawns and rocket. Use a vegetable peeler to peel ribbons from the courgette. Mix the marinade together in a bowl, season and add the courgettes. Give a mix to ensure the courgettes are coated and leave to marinade for 3 minutes before serving. Mix the chilli, lime, turmeric and oil together to form a paste and season. Marinate the prawns for 3 minutes before cooking for a few minutes on each side in a pan on a medium heat. As a vegetarian alternative, use the marinade to cure cubed courgette. 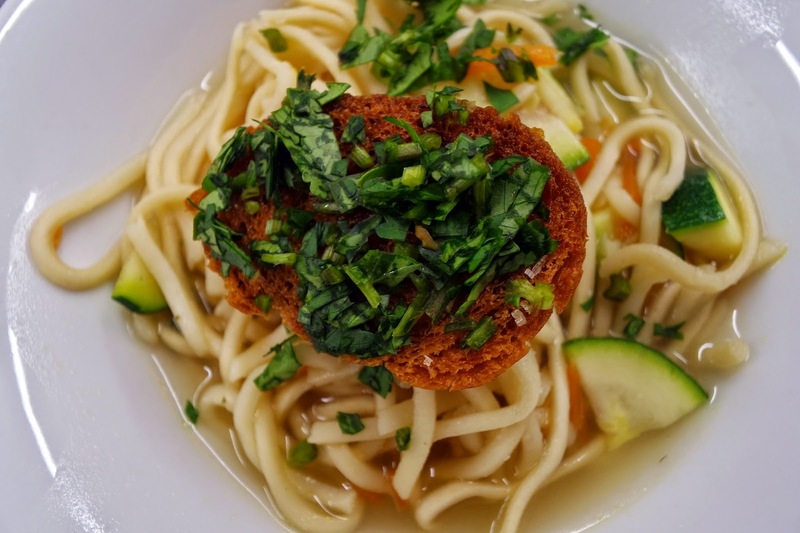 Noodle broth with coriander crostini. Add a little oil to a hot pan and caramelise the 4 chopped carrots, 2 onions and 1 celery. Fill a stock pot, add the vegetables and bring to boil. Continue until reduced by half and sieve. Alternatively, use 2 pints of shop-bought vegetable stock for 6-8 people. Soak a pack of egg noodles to remove wax before adding to the broth to cook for 5 minutes. Slice a part-baked baguette, drizzle pieces with oil, season and toast under the grill until golden. 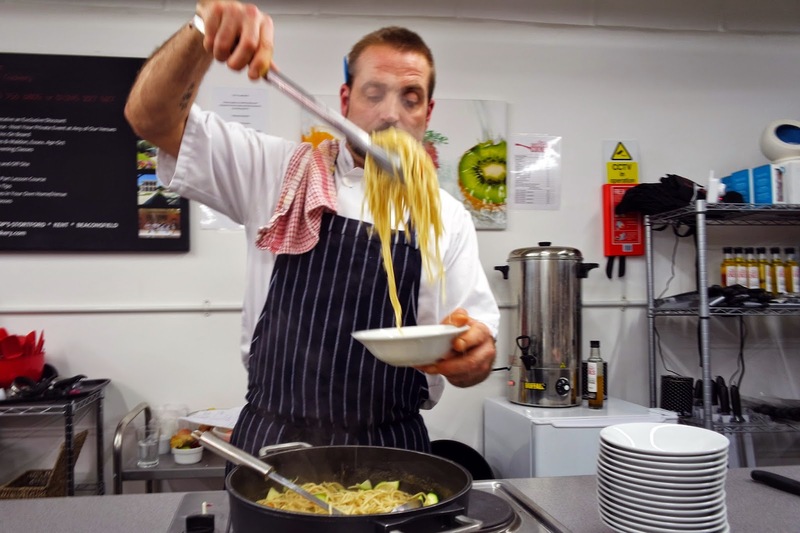 To serve, ladle noodles and broth into bowls, top with crostini and a generous sprinkle of coriander. You can also add seared chicken pieces to make into a bigger meal. Hungry bloggers Tweeting at the dinner table *tsk*. To make the curry paste, add the cumin, coriander, chilli, galangal, ginger to a bowl. Season and add a little water to combine. Heat a pan with 1tsp oil, add diced onion and cover with a drop of water to steam. Add the curry paste and heat before adding the coconut milk and the rest of the ingredients (except coriander and zests). Cook the chicken first by poaching in a pan of water until cooked through. Add to curry with fresh coriander, lime juice and zest. 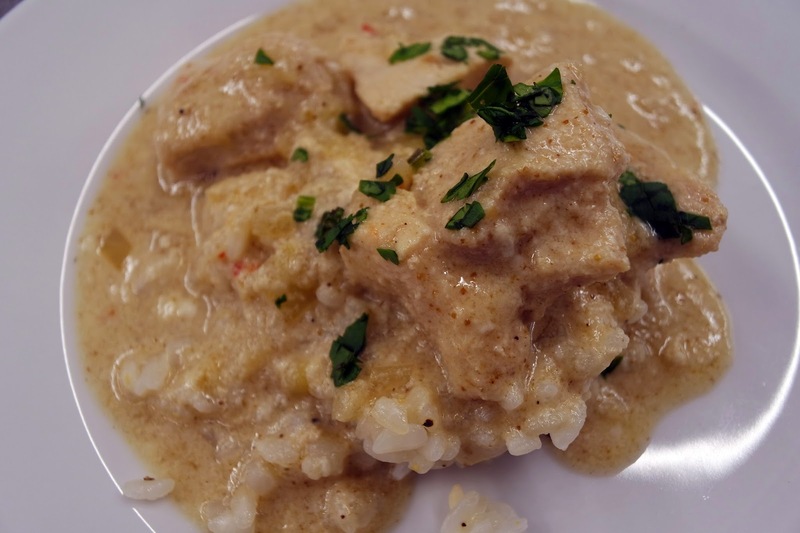 To serve with sticky rice, add 125g per 2-3 people to a shallow pan. Add 2 cups of water per 125g of rice. Stir to release starch, cover and cook in oven for 15-20 minutes. As a vegetarian alternative, use 2 cans of chickpeas. 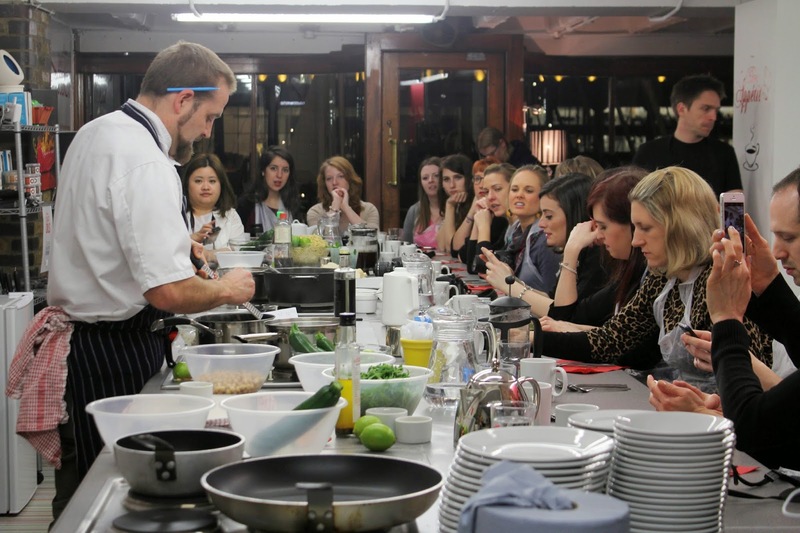 During the class Chef Stu took us through the steps for each dish whereby we all had a turn in stirring, chopping, seasoning and tasting throughout the evening. Knowledgable and relaxed, Stu had time for each and every one of our questions which is a lot for a relatively big group of around 20 bloggers (and cameras)! A big thank you to LV= and Joe Blogs for inviting me, I can't wait to get cooking a recreate some of these dishes! Take a look at LV='s Love Life page, you'll find articles and tips on Living a healthy, happy lifestyle including their blog post of the evening. 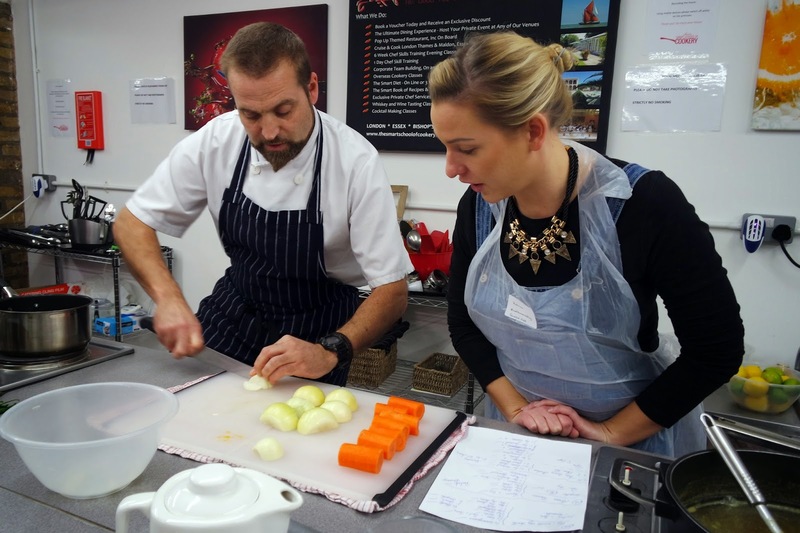 You can also find out about The Smart School of Cookery classes and venues here.